What is The Dark Sorcerer? » What is The Dark Sorcerer? Most of you have probably seen the E3 video and been dumbfounded - and rightly so. The Dark Sorcerer tech demo was incredibly confusing. We don't know what Quantic Dream are planning to do with this technology, as the video really didn't give much away. However, we can definitely speculate on what we've been given. The 12 minute cinematic demo that was released at E3 showed a sorcerer and a goblin casting dark magic spells- when suddenly the fourth wall is broken. 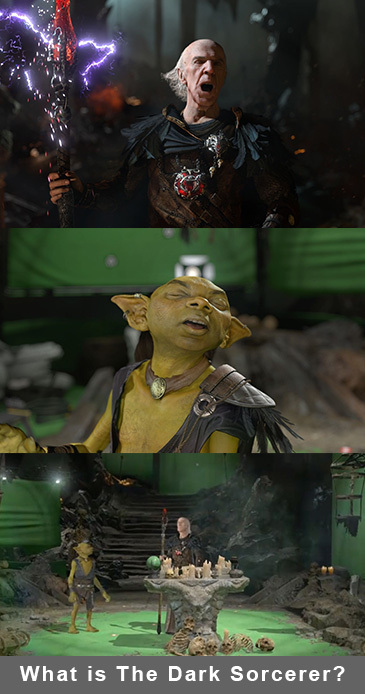 The sorcerer and the goblin turn out to be actors on a video game film set. We see a green screen and several props, and the characters even talk to their director. The actor playing The Dark Sorcerer appears to be at a loss. There is some comedic character interaction that follows between the actor, the goblin and a strangely camp demon. It's very well written and definitely will bring out a few laughs with some viewers. The tech demo actually breaks the illusion of game development in Quantic Dream and shows us that behind the scenes, there are just a bunch of actors and a green screen. While the video itself is entertaining, the key objective of its creation was to show off the technology of the PlayStation 4. If you've seen the video you can tell that the graphics on display are ridiculously impressive. You can see the slightest emotion in each character's face. There are some really detailed particle effects - embers and dust particles are visible while floating around the screen. The flames produced in a demonic ritual look spectacular, they change the lighting and atmosphere of the surrounding area drastically. This tech demo from Quantic Dream gives us a great idea of what to expect from their upcoming games. We've already seen with Heavy Rain and other such titles that Quantic Dream know how to make games with top of the line graphics. If they bring that same style of immersive, cinematic gameplay to the next generation of consoles then we can expect something spectacular. Unfortunately, there are no current plans to turn The Dark Sorcerer into a game. While this is quite disappointing for some of us, it's expected. The trailer really didn't show off much about a potential game, and really only just showcased graphics and some witty character design. However, fans of Quantic Dream have been saying that they would like a fantasy genre game. We've seen fantasy games in the past have some really deep character interaction and story development. Games like Dragon Age did it exceedingly well. If Quantic Dream took their style of game development to the fantasy genre it could really change things up and create a new and exciting experience for PS4 users. As for how the tech demo for The Dark Sorcerer was created, it was done using motion capture technology. This is a method that Quantic Dream are notorious for. Their upcoming PlayStation 3 game "Beyond Two Souls" used it extensively. Behind the scene footage shows Ellen Page - who plays the game's antagonist - playing her part in a motion capture suit. While this is a very realistic and graphical approach to game development, people will often prefer for characters to have a variety of canned animation that allow their character to go wherever they please. But in a way, the cinematic aspect of Quantic Dream's games is what sets it apart from other games. They have stories as deep as any you'll find in a movie and they use Hollywood actors that a lot of people will recognize. This isn't the first tech demo Quantic Dream has released either. Many of you will remember "Kara" the 2012 video about a prosthetic robot woman. While completely different to The Dark Sorcerer in tone, it served the same purpose by giving users a taste of things to come. Would you like to see Sony make The Dark Sorcerer? Post your comments below! Fun read, lets hope they make this into a game! I would buy it. And yes agreed the graphics are ridiculous! Why not have the same video run on the PS4 and one on the Xbox One. Just to see if there is an noticeable difference. I would be curious myself... given that people always want to bicker as to which system is better. It looks like one of the best games I have seen for a while and it would be ashame not to make the game as i believe it would be a great disappointment for a lot of people if it does not come out for sale.